As part of my plan to use what I had to make Christmas presents, I decided to refashion the oatmeal canister I had of old, broken crayons into new, awesome crayons. 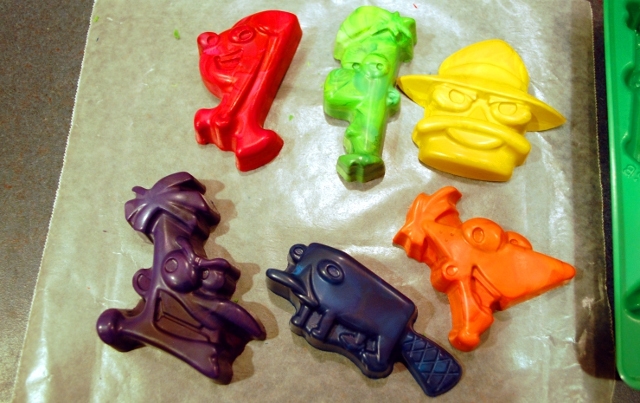 We’ve made recycled crayons before, but I used a silicone ice cube tray and the results were less than stellar. 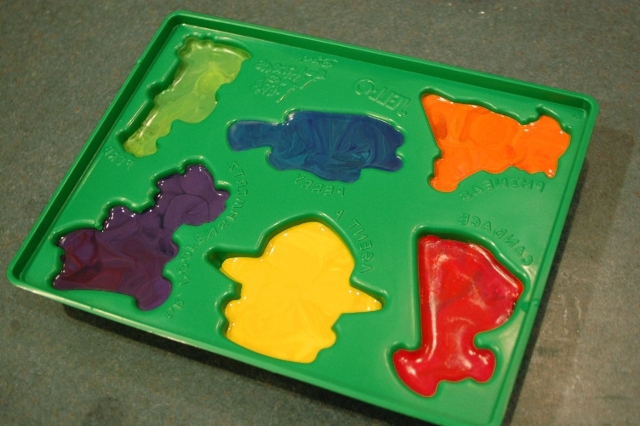 The shapes were a little fuzzy, and the tray was permanently stained by the wax. I’ve seen some amazing, crisp, gorgeous recycled crayons around (like on Etsy) and I can now tell you that I’ve discovered the secret: hard plastic molds. I found the Phineas and Ferb mold in the Jell-o aisle at Walmart for $1. Turns out, it’s actually really easy to use them, and the results are great! 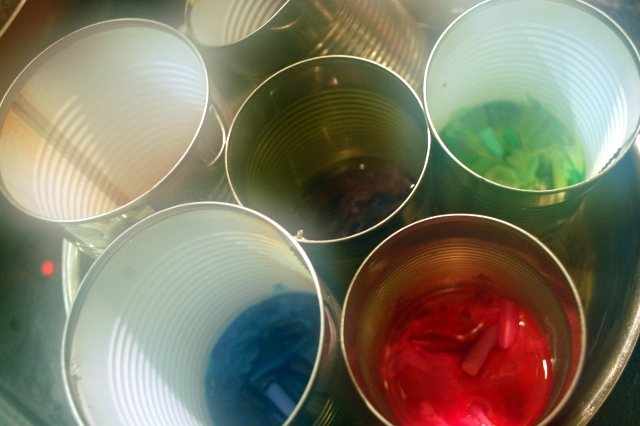 First, you need old empty cans – one for each color you’re going to melt. I saved six so I could make each crayon a different color. Peel your crayons – this works better with a razor to split the wrappers down the side – and sort them by color. Then, place your cans in a pot with some water. You want enough to cover the bottom of the pot without making your cans float. On medium/low heat, boil your water until the crayons are all melted. (CAUTION: do not leave wax unattended.) 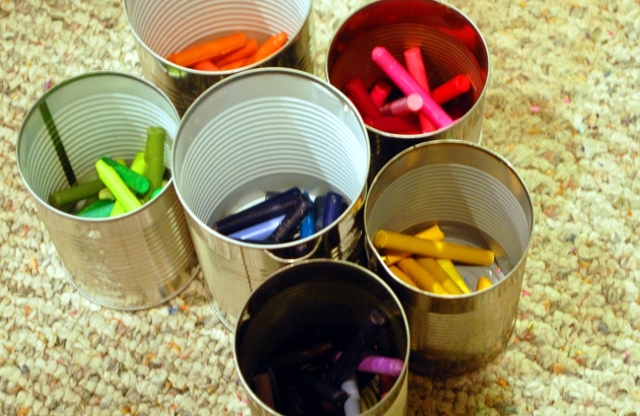 Be sure that you don’t get any water in the cans either, but it doesn’t take long for the crayons to melt. Once they’re melted, pour carefully into the mold. Now you just have to wait for them to cool down and solidify! This can take a while. Once they’re hard, turn the tray over and tap gently to remove the crayons. If any of them are being stubborn, you can put them in the freezer for a few minutes and they’ll pop out really well. See how clean the tray is?! You could easily make the crayons in different colors the next time without having them stained by the residue of your first try. I would even still use this tray for food! I have to say, now that I’ve tried the hard molds, I’m never going to make crayons in the flexible silicone trays again. The results are just better. Smooth, Sweet Chocolate – from Scratch! Would this work for soap? You could take your Ivory or Dial and melt & form? would this be the same sort of mold that you use to make candy with the candy melt wafers?